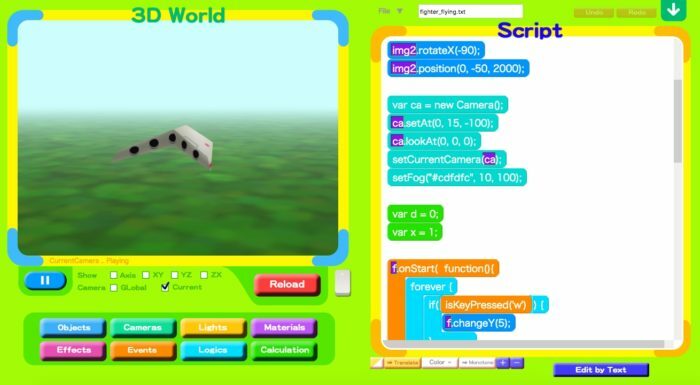 “KidsScript”, free entry-level 3D programming tool for kids. NextObject, a Tokyo-based design and programming studio releases, “KidsScript”. Intended for kids as the name suggests, it is designed to initiate them or make them evolve in 3D programming. KidsScript’ users also include entry-level programmers, mainly kids, those who have a keen interest in 3D programming as well as 3D creators. Available in English and Japanese, the software enables to create “3D” worlds and games. Furthermore, 3D models created on other software can be achieved with KidsScript. However, it is not yet possible to get a development environment that is appropriate for kids to create entry-level 3D programs. Last, it is possible to release created programs to public as applications. In other terms, each creation made using KidsScript can work on any website as hand-made HTML5 applications.